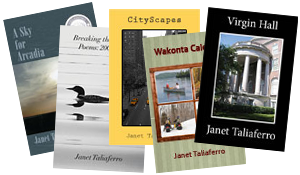 Breaking the Surface ($7.50 paper / $1.99 kindle), a chapbook of poems written about the lake house in Northern Wisconsin where the poet spent summers in her youth and that she still shares with her family. They are poems of memory and place as well as encompassing the arc of a life lived. The summer of 1941 seemed a world away from the wars in Europe and Asia that would soon consume all of our time and attention. That July, while our family visited one of my father’s relatives in Michigan, my mother received a call that her father had suffered a heart attack in Minnesota. My parents chose the shortest route to reach him, and that route took us right through the North Woods of Wisconsin. As we drove up US 51, we came to a bridge with a view of a blue lake, a long point nearly bisecting it, and many islands within it. “I want a house on that lake,” Mother said. Her statement found a home in Breaking the Surface, just as four generations of our family has found refuge, comfort, and a connection to nature in the house she wanted. Breaking the Surface combines poetry about nature, human motivation, conflicts, and resolutions—all connected to the place we recognize as our spiritual home. Breaking the Surface juggles a wide range of emotions within a large periphery, a perspective that includes that wisdom of a certain age when there is much to cull from family, culture, and individual histories. Never sentimental, the poems do not shirk from the truth, nor is anger ignored. Sharp twists of irony delight, such as in the poem “Looking for Perfection,” when the reader discovers with the poet that the only perfection on a bright leaf is “a perfect oval” carved out by an insect; or a poem confronting sibling rivalry leads us to “Today I am only one day older than he will ever be.” The elegantly sculpted stanzas create an easy flow in which we can savor the treats of poetry: lusciously extended metaphors such as in “Weather Report,” which cunningly examines marriage; or vivid descriptions of Wisconsin scenes that enhance the poem’s meanings, and unflinching contemplations on the myriad shades of family life woven throughout this powerful collection. From the first “Search for Perfection” and its surprising ending, we expect an insight into the natural beauty of woods and lake as well as an understanding of change and pain. Janet Taliaferro does not disappoint. Her chapbook of “stor[ies]…cut to their own pattern” is lovely and intense. She shows us how to make “the ghosts” of our own lives “more comfortable.” Breaking the Surface is writing by a mature poet in control of her craft.